The Harpoon RGB Wireless launched at CES 2019 a few weeks ago alongside the Ironclaw RGB and M65 RGB Elite. As the name indicates it offers wireless connectivity (via both 2.4GHz and Bluetooth 4.2), and it also comes with six programmable buttons and a '10,000 DPI' optical sensor. Said features can be yours on this side of the Atlantic for £55, which is pretty steep considering the US pricing of $50 but also not that expensive for a wireless gaming mouse with a decent feature set. The Harpoon RGB Wireless is an upgrade of an existing wired design (the Harpoon RGB, obviously). One of the upgrades is the sensor, which moves from 6,000 DPI to 10,000 DPI. For most users and especially gamers, this difference will be meaningless, as few are likely to use anything above 6,000 DPI with any regularity. However, bigger numbers look better, so it’s not a surprising move. The exact sensor is PixArt’s PMW3325, which has a native DPI of 5,000, meaning Corsair is using interpolation to hit any number above that. Amusingly, this wasn’t working with the latest software at the time of writing; numbers above 5,000 DPI weren’t even available to use. While adding wireless connectivity and thus a battery has added around 15g to the weight, an overall weight of 100g is still lightweight as far as wireless mice go. The mouse feels solid, and textured rubber sides are complemented by a slightly grainy matt plastic top cover, a combination that works well and is comfortable to yield. One small complaint, though, is that the four PTFE feet are pretty small, which is noticeable compared to those with larger ones in that you’re a little more likely to feel small surface imperfections as you move. A small compartment in the bottom is used to store the USB wireless dongle, which is useful. There’s also a simple switch for choosing between 2.4GHz wireless and Bluetooth as well as an off position. We had no issue setting making a connection almost immediately with either method. The 2.4GHz wireless connection is marketed by Corsair as Slipstream Wireless technology. 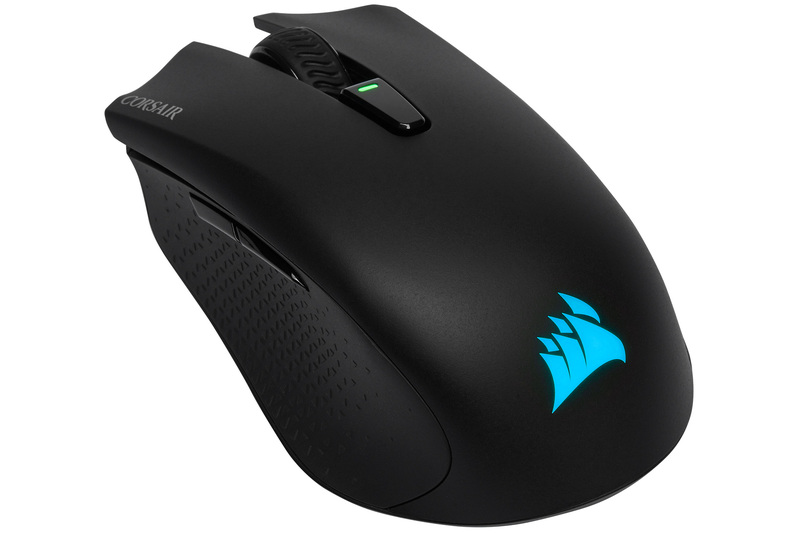 There is a lot of marketing jargon in the description of this and few technical details, but Corsair claims that it is as good as or better than a wired connection thanks to latency levels able to go below 1ms, thus ensuring that the polling rate of 1,000Hz typical of gaming mice can be maintained. A feature bolstering this is called Intelligent Frequency Shift, which supposedly retains a strong connection even in the presence of heavy wireless traffic, such as that found in most modern homes, by being able to hop to the fastest available channel on the fly. Corsair also claims a battery life of up to 30 hours using lighting and 45 hours without lighting, and it also says the range is good for up to 10 metres. I tested at around 5-6 metres (it’s not practical to do more than this where I live), and all was fine. The Bluetooth 4.2 connection, meanwhile, offers a latency of 7.5ms at a minimum, which isn’t suitable for fast-paced competitive games but may suffice in casual/single-player titles and is fine for productivity. The benefit is longer battery life, with 40 hours claimed for when the lighting is on and up to 60 hours per charge with the lighting off. You can only choose the lighting mode in software, which requires a USB or 2.4GHz wireless connection – perhaps a hardware toggle for the lights would be better in case you find yourself running low in Bluetooth mode, or lighting should just be off in Bluetooth mode, since you cannot change it away from rainbow mode (spectrum cycling). Charging via the supplied cable is said to take around two hours. You can of course play while the mouse charges, but those who want to avoid cable clutter could also just leave the charging cable connected to a standard mains-to-USB charger. The design is ergonomically crafted for right-hand use, and while it has the shape associated with mice designed for a palm grip, the size makes it more suited to claw or fingertip grips. This makes the rubber sides all the more important, as it allows your fingertips to keep a firm hold of the mouse. It didn’t take me long to get used to a claw grip, and since I tend to prefer a palm hold I reckon that’s a good sign. Corsair’s main buttons use Omron switches rated to 50 million clicks, and I found these to have their usual crisp, light action, which is rated at 60g and with a distance of 0.45mm. The scroll wheel has a textured rubber surface and is pleasant both to click and to scroll, while the single DPI button behind it is quick to actuate thanks its size and light actuation force. The two thumb buttons are fairly easy to hit, but the build quality takes a small hit here, as they rattle about a little especially when moving fast to the right. RGB lighting on this mouse is single-zone i.e. the rear logo only. As mentioned, custom effects for this are only available with a USB or 2.4GHz connection; Bluetooth is limited to rainbow cycling only. There is also a multi-purpose LED indicator on the DPI toggle, which can be used to show information about connection and battery statuses as well as the current DPI level. The light will be blocked by your index finger, but it’s bright enough to reflect off of your middle finger – useful for quick glances. I’ve covered iCUE as it applies to mice very recently in my Ironclaw RGB review, so I won’t repeat myself much here. In short, it’s a powerful and comprehensive bit of software with most intuitive UI. Creating custom profiles is easy, and you can tie them to automatically kick in with certain apps or games. The six buttons on this mice are all programmable with custom functions, with a healthy range of available options included custom macros via a powerful recording/editing section. Various lighting effects are also available, including ones that will synchronise with other iCUE-enabled Corsair components you have. You can have up to five DPI levels here (six if you also enable one of the buttons for sniper mode), ranging from 200 to 10,000 DPI and changeable in 100 DPI increments. X/Y separation is available, and you can disable any DPI stages you don’t need as well as set custom RGB values for the indicator light. While it does have onboard memory, the Harpoon RGB Wireless doesn’t have true onboard profile support. Instead, it essentially relies on the last settings you had active in iCUE and will retain these when used with other PCs (and/or in Bluetooth mode). Custom commands do not carry over, but the lighting and DPI settings do. Performance from the PMW3325 sensor is hard for me to fault. I was unable to notice any difference between wired and 2.4GHz wireless modes; one feels just like the other even in fast shooters, and not having any cable to worry about is nice in games. To my eyes, the mouse is free from acceleration too, and only exhibits very minor jitter as you approach 5,000 DPI. I was unable to test above that due to the software bug, but most users will avoid such levels anyway. Lift off distance is a bit high and cannot be customised; I found the mouse cuts off at somewhere between two and three optical discs, whereas the best sensors will cut this to between one and two or even below one. The Harpoon RGB Wireless is designed to offer uncompromised wireless performance to gamers who don’t want to spend crazy amounts of money on a mouse; many top tier wireless mice are over £100, for example, but this one joins the ranks of mice from the likes of Razer and Logitech that bring wireless gaming to more people. The ability to switch between 2.4GHz and Bluetooth is handy; I can easily see it being useful to have 2.4GHz enabled when gaming in the living room but then saving battery when taking the mouse out and about for productivity. The feature set in terms of buttons, custom functions, and DPI levels is decent enough relative to other wireless offerings, and the mouse is backed by a great software package. The sensor and switches perform fine too, so if you’re after a decent wireless gaming mouse that doesn’t break the bank, this could well be it.